We will be closed on Friday 19 April and Monday 22 April for the Easter Break. If you require advice whilst we are closed, please call NHS 111 free of charge. If you require urgent treatment please attend your local walk in clinic or, in an emergency, your nearest A&E department. We will be back open as normal on Tuesday 23 April. We will be open as normal for the Trafford Primary Health hub pre-booked appointments on Saturday 20 April 2019. Trafford Carers Week takes place 10-16 June 2019. For more information about the activities that are taking place, please click here. If you are our patient and you are a carer or if you care for one of our patients, please make sure we are aware so that we can provide the best possible support for you. The provision of extended hours appointments at the Firsway Hub has been extended for a further 6 months by Trafford CCG. Please click here for a summary of our first few months of operating the service. A new seniors community guide has just been published which includes the popular What's on Where guide. To view the guide, please click here. We are disappointed to note that 274 appointments were wasted in December due to patients not attending and not cancelling their appointments. These appointments were for GPs as well as nurses. This is a waste of resources and means other patients could have been seen sooner. Please, if you don't need your appointment, let us know. You can call us or if you're not registered for patient online access, register when you next come to the surgery then you can have access to book or cancel your appointment yourself at a time that is convenient to you. Thank you. The surgery will be closed from 1pm on Thursday 24 January for protected learning time. We will be open for planned extended hours appointments from 6.30pm - 8pm. If you require advice whilst we are closed, please call NHS 111 free of charge. If you require urgent treatment please attend your local walk in clinic or, in an emergency, your nearest A&E department. Thank you for your patience and apologies for any inconvenience caused due to circumstances beyond our control. Please be aware that we are experiencing a problem with the telephone system which is also affecting others in the local area. Our phone supplier is aware of the problem and is trying to resolve it as soon as possible. In the meantime, we have been transferred over to our emergency back up. We apologise for any inconvenience caused during this time. We will be open as normal on Monday 24 December, Christmas Eve, from 8am - 6.30pm. We will be closed on Christmas Day, Tuesday 25 December and Boxing Day, Wednesday 26 December, and will re-open on Thursday 27 December at 8am. If you require advice whilst we are closed, please call NHS 111 free of charge. If you require urgent treatment please attend your local walk in clinic or, in an emergency, your nearest A&E department. We will be open as normal on Monday 31 December, New Year's Eve, from 8am - 6.30pm and closed on New Year's Day, Tuesday 1 January. We will re-open on Wednesday 2 January 2019. We wish all of our patients a happy and healthy festive period. For an up to date list of when pharmacies will be open over the Christmas and New Year period, please click here. We have updated our gritting policy - please click here for more information. Please be careful if you choose to use our car park. The parking bays and car park itself can become slippery if the temperatures fall. We don't grit the car park itself but do grit the paths around the car park so please take care. Still not had your Flu Jab? Firsway will be holding further walk in clinics on Thursday mornings from 22nd November until 13th December between 9am and 11am. Stay Well This Winter. We had 254 wasted appointments in October 2018 because patients who had booked them, failed to arrive or cancel. Please let us know if you are unable to attend your appointment so that it can be offered to somebody else. Thank you. 31 October 2018 - New arrangements for blood test clinics - appointments must now be booked. From Thursday 1 November 2018, all blood tests for adult patients in Trafford will be by appointment only. Walk-in clinics will no longer be available. Patients will need to contact the booking number: 0161 934 8361. Please note that the new appointment booking system excludes housebound patients. Housebound patients will continue to be visited at home by the phlebotomy team. Please click here for more information and here for the leaflet detailing the clinic venues and opening times. The practice's boundary has recently been increased to include parts of Carrington. Please click hereto see our updated practice boundary. If you are looking to register as a patient with us, please contact reception for more information. We are holding another one of our very popular patient information evenings on Tuesday 9 October 2018 at 6.30pm. The event this time is focussed on patients with diabetes and managing weight loss. If you would like to attend, please contact reception. Places are limited and are available on a first come, first served basis. Despite our text reminder service, 258 patients missed their appointments in September. Please ensure we have your correct mobile number on your record by checking with reception and please let us know if you are unable to attend your appointment to enable other patients to be seen. Thank you. The surgery will be closed from 1pm tomorrow for protected learning time. We will be open for planned appointments from 6.30pm - 8pm. If you require advice whilst we are closed, please call NHS 111 free of charge. If you require urgent treatment please attend your local walk in clinic or, in an emergency, your nearest A&E department. Age UK have teamed up with a number of agencies to offer a falls prevention awareness session on 26th September from 11am - 2pm in Urmston. Refreshments are available and there will be free electric blanket testing on the day too. Please click here and here for more information. If you are collecting a prescription on behalf of a relative or friend, we will need to have the patient's consent. Verbal consent is acceptable. Please ask at reception for more details. Your co-operation in appreciated in helping us to ensure we comply with the requirements of the Data Protection Act 2018 and the General Data Protection Regulations. Thank you. We will be closed on Monday 27 August as it is a Bank Holiday. If you require advice whilst we are closed, please call NHS 111 free of charge. If you require urgent treatment please attend your local walk in clinic or, in an emergency, your nearest A&E department. We will be back open as normal on Tuesday 28 August. Do you care for someone? If so, would you like to meet with other carers for a chat and a cuppa? We are holding our next Carers coffee meeting at Firsway on Thursday 20 September at 1pm. Trafford Carers also attend with useful hints and tips about support and benefits that may be available to you. All are very welcome. If you'd like to know more, please contact the practice and ask for Angela Holland. The meeting was very positive and the chairs of each group will be meeting separately now to develop a 6-12 month plan of action including putting together a Joint Newsletter. If you'd like to get involved, please ask at Reception for details. We know that whilst most people are enjoying the heatwave we are currently experiencing, some people don't and it can even be dangerous for those with existing medical conditions, the young and the elderly. Click here for a handy checklist on how to keep cool and what to do if you need help. 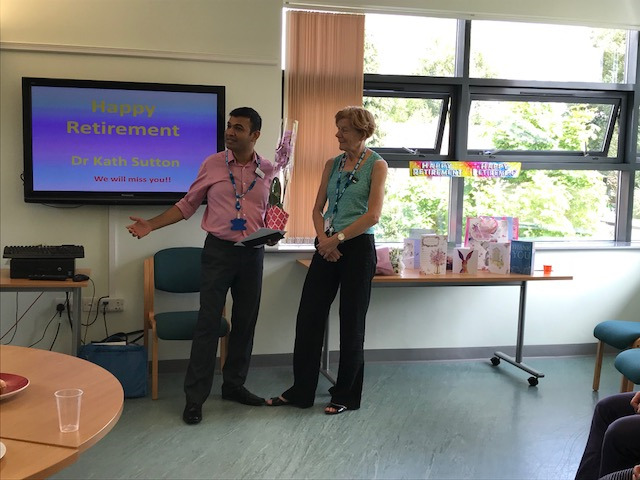 Dr Sutton retired last week having served Trafford and Firsway's patients for the last 28 years. Thank you to everyone who came to her presentation - we gave her a lovely send off. We will miss her hugely but hope she has a long and happy retirement. 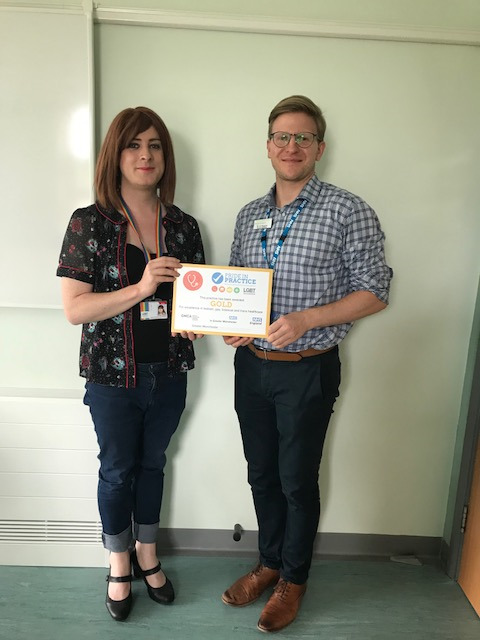 We are delighted to announce that we have received a Gold Award from the LGBT Foundation Pride in Practice Scheme 'For excellence in lesbian, gay, bisexual and trans healthcare'. Here is a photo of Dr Scott Pearson receiving the award from Aimee Linfield, the Pride in Practice Co-ordinator. If you are interested in completing an apprenticeship at Firsway Health Centre please follow this link to apply https://www.nltg.co.uk/job/apprentice-receptionistadministration-assistant/ and we will be in touch for an interview. If you would like more information please call and speak to Lauren Hinds, Reception Manager or Tara Clements, Patient Services Manager. We had 228 wasted appointments in June 2018 because patients who had booked them, failed to arrive or cancel. Please let us know if you are unable to attend your appointment so that it can be offered to somebody else. Thank you. We currently have a large number of items in our lost property box including sunglasses, drinks containers, keys and clothes. If you have lost something and think it may have been whilst you were at Firsway, please ask at Reception. Thank you. 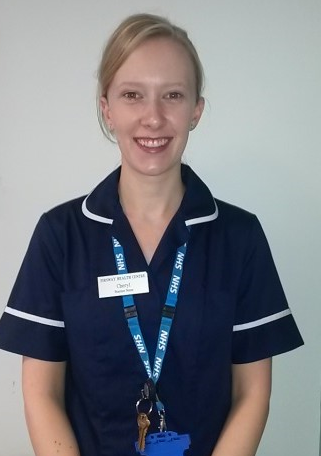 Did you know that you will be able to book evening and weekend GP, Nurse and Phlebotomy appointments at Firsway Health Centre from the 2nd July? This is for Firsway patients and patients Trafford wide. Firsway Health Centre has been awarded the extended hours contract for the Sale Central Neighbourhood. 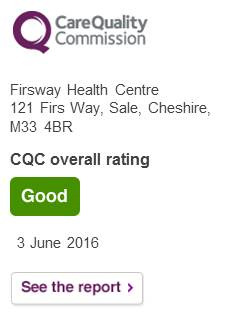 The awarding of the contract to Firsway was decided by the CCG, the LMC, Healthwatch (patient focussed) and Trafford Primary Health, which shows a great amount of confidence in us. Appointments can be booked by anyone who lives and is registered with a GP surgery within Trafford. All you need to do is speak to the surgery you are registered with and ask them for an extended hours appointment at our Hub. Our Practice Manager Paula Lea said ‘This is great for the people of Trafford and gives them greater accessibility to GP services. As a practice we are determined to give patients across Trafford a seamless and excellent experience’. This initiative is to give patients more access to services outside of Mon-Fri working hours as well as alleviating the wait times and demand on Walk-in Centres and A&E. There are currently 4 Hubs in Trafford which are Flixton Road Medical Centre, St.Johns in Altrincham, Firsway Health Centre and North Trafford Group Practice. Any patient registered at a Trafford GP surgery can book an appointment at any of the hubs, via their own GP practice. Moving forward we hope that the hub/extended hours proves very popular with patients and can be rolled out to other areas across the UK to give patients more choice in when and where they see a GP or nurse. Firsway's walking group has merged with one being set up at Bodmin Road Health Centre in an effort to make both sustainable and to start a few new walking routes to keep everyone's interest going. The next walk takes place today 10.30 from Woodheys Park, Woodhouse Lane meeting at the pitch and putt building. All are welcome. For more information about walking groups across Trafford, please click here. Dr Sutton will be retiring mid July 2018, having worked for Firsway and Meadway for 28 years. We are going to miss her very much. All are welcome to pop in to see her on 18 July 10.30am -12noon in our education room if you would like to say farewell. Did you know that it is Cervical Screening Awareness Week from 11 - 17 June 2018. We have appointments available with our practice nurses and at other locations in Trafford if your smear test is due. Please contact reception to book an appointment. We will be closed on Monday 28 May as it is a Bank Holiday. If you require advice whilst we are closed, please call NHS 111 free of charge. If you require urgent treatment please attend your local walk in clinic or, in an emergency, your nearest A&E department. We will be back open as normal on Tuesday 29 May. We will be closed on Monday 7 May as it is a Bank Holiday. If you require advice whilst we are closed, please call NHS 111 free of charge. If you require urgent treatment please attend your local walk in clinic or, in an emergency, your nearest A&E department. We will be back open as normal on Tuesday 8 May. A local organisation produce a guide to what's on where in Sale and Altrincham - it's a comprehensive list of support groups and stimulating activities for elderly people. For more information, please click here. We had 213 wasted appointments in April 2018 because patients who had booked them, failed to arrive or cancel. This number has dropped compared to previous months so thank you to those patients who do let us know when they do not need their appointment. The surgery will be closed from 1pm today for protected learning time. We will be open for planned appointments from 6.30pm - 8pm. If you require advice whilst we are closed, please call NHS 111 free of charge. If you require urgent treatment please attend your local walk in clinic or, in an emergency, your nearest A&E department. We had to evacuate the building this morning at 8.10am when our fire alarm sounded. The fire service attended and gave us the all clear to return at 8.30am. We apologise for any inconvenience this caused to our patients as we were unable to answer telephone calls at this time. I am sure you will understand that the safety of our staff and patients had to take priority. Two hundred and sixty six appointments were wasted by patients who did not attend the appointment they had booked themselves either with a Doctor or one of our Nursing Team in March 2018. Please ensure you cancel your appointment if you are not able to attend or no longer need it. Thank you. We will be closed on Friday 30th March and Monday the 2nd April for the Easter Break. If you require advice whilst we are closed, please call NHS 111 free of charge. If you require urgent treatment please attend your local walk in clinic or, in an emergency, your nearest A&E department. We will be back open as normal on Tuesday 3rd April. Thank you to all who attended the session on the 15th March 2018. The session proved to be very well received and we've had some great feedback from the patients who attended. We are planning to hold more in the future so please keep an eye on our website for more information in due course. 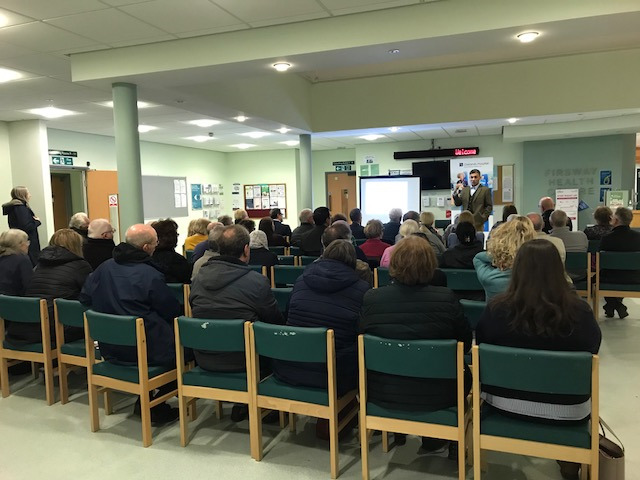 The patient information evening takes place tonight - if you have booked your place, please attend promptly for a 6.30pm start. Places have had to be limited and demand was extremely high so please accept our apologies if you were unable to book. This is the first time we have done something like this so we had no way of knowing how many patients would be interested. We will be offering other sessions in future, information will be available here on the website as well as by text so please ensure you check the website regularly to be kept informed. Thank you for your interest in what we hope will be a useful programme for our patients. You may have noticed that we are encouraging you to let us have your up to date mobile number. This is to facilitate you receiving automatic text messages reminding you of your appointments. We are able to then also contact you via (our free) text messaging service. We hope that you find the messages we send to be useful and informative. For us, it is a quick and cost-effective way of communicating information to large groups of patients and is therefore, a good use of our staff and financial resources. If, however, you prefer not to be contacted by text message, please let reception know and we will opt you out of this service. Please note, however, that you will not then receive appointment reminders and will not be advised about any health campaigns or other services we may provide. 19.2.18 Are you up to date with your smear test? Today, 16.2.18, I attended at Firsway HC for a routine cervical screen. I was seen by Sister Tierney. I would like it to be noted that her approach and manner was second to none. She made me feel calm and comfortable and therefore made the whole experience much much better than it could have been. As a nation we are desperately trying to encourage people to attend regular cervical screens. With nurses like Sister Tierney at Firsway HC I'm sure patients won't hesitate to reattend. Thank you. If you know your smear test is due, please contact reception to book in. We are holding a patient information evening on 15 March 2018 at 6.30pm. Mr Guava Batra, Orthopaedic Consultant, will be giving a talk on 'How to look after your joints'. The event is free and all are welcome. Places will be limited so if you'd like to attend, please book in with reception. For more information, please click here. A total of 260 appointments were wasted in January 2018 by patients failing to notify us that they would not be attending. Please, if you don't need your appointment, let us know so that someone else can use it and help us to use NHS resources effectively. If you haven't already registered for online access which would allow you to book and cancel appointments online from a device of your choice, please ask at Reception for more details. It's quick and easy to register - you just need to bring some ID with you to Reception. We will be closed on Wednesday 24th January from 1pm for Protected Learning, if you need any assistance please still call our number on 0161 905 0310 and you will be diverted to Master call - the out of hours provider. We will be back open as normal on Thursday 25th January at 8 am. Did you know that we have an established walking group that meets each Wednesday at 11.30 am to do a 45 minute walk in the local area? It is run by 2 of our patients. They are a friendly group and would welcome anyone who would like to join them. If you're not signed up, please just come 15 minutes early to complete the registration form. The members are really enjoying the exercise and each other's company. All are very welcome. We are looking for 2 part time Receptionists to join our friendly team, please apply on the NHS jobs wesbite if you are interested in working in our busy health centre. Thank you to all our patients and staff who have donated recently to our collection point. Our contribution is being delivered today in time for Christmas. Please continue to donate - your help is very much appreciated by those who need to use the Foodbank service. Thank you. We would like to say a huge thank you to all of our lovely patients who have brought us some very kind gifts over the last couple of weeks. We held a raffle and each member of staff has received a gift. Thank you to you all. We will be closed on Monday 25 and Tuesday 26 December and will re-open on Wednesday 27 December at 8am. If you require advice whilst we are closed, please call NHS 111 free of charge. If you require urgent treatment please attend your local walk in clinic or, in an emergency, your nearest A&E department. We are also closed on Monday 1 January and will re-open on Tuesday 2 January 2017. We wish all of our patients a happy and healthy festive period. Did you know that patients who are registered at this practice can book an appointment to see a GP or nurse on weekday evenings (between 6.30pm and 8pm) or on Saturday mornings? Evening appointments will take place at this practice, weekend appointments take place at Boundary House Medical Centre. Please speak to one of the receptionists to find out more or book an appointment. 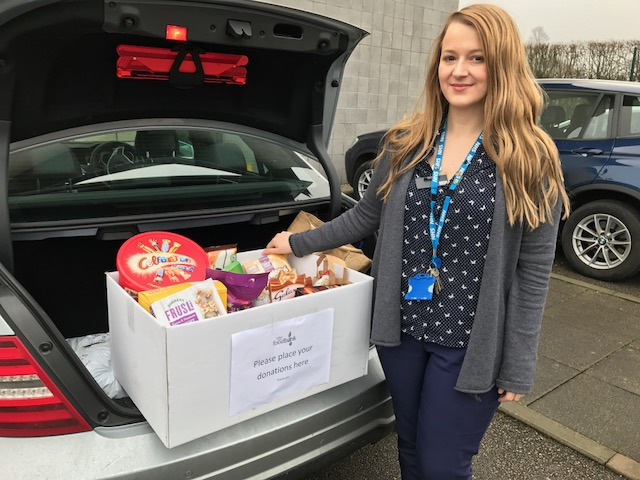 From Monday 11 December, Firsway will be acting as a collection point for donations of food for Trafford South Foodbank. If you would like to make a donation (which will be collected regularly), there will be a box near the Reception Desk. A list of the items that can be accepted can be found here: https://traffordsouth.foodbank.org.uk/give-help/donate-food/ In the run up to Christmas, they are also accepting Christmas treats eg chocolates, biscuits, toiletries, nappies, snacks and are very keen to receive long-life milk (an item rarely donated apparently). If you would like to make a donation, please bring to the surgery during opening hours. Thank you. 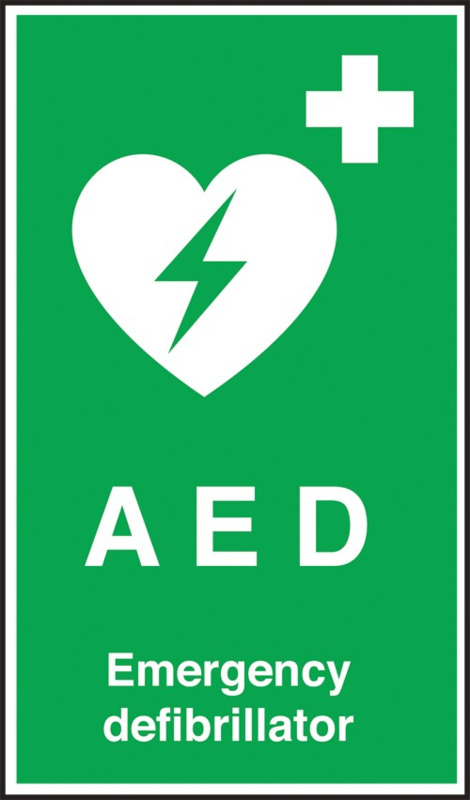 We are delighted to let everyone know that we are now sharing access to our defibrillator with our local community. Our Patient Participation Group helped to raise some money towards the cost of the cabinet that we needed to house it on the wall outside. Special thanks go to our Patient Participation Group for their hard work in raising the funds and to Sainsbury's and Cohens for their kind donations. For more information on how important a defibrillator can be if someone is having a heart attach, please click here. For more details of our sponsors and a photo, please click here. A total of 276 appointments were not used in November due to patients not cancelling them. Please, if you don't need your appointment, let us know so that someone else can use it and help us to use NHS resources effectively. If you haven't already registered for online access which would allow you to book and cancel appointments online from a device of your choice, please ask at Reception for more details. It's quick and easy to register - you just need to complete a form and bring some ID with you. St Ann's Hospice have a Health and Wellbeing Hub drop in service offering information and advice as well as an opportunity to gain an insight into the services that are provided. Anybody is welcome – patients and carers. For more information, please click here. A total of 260 appointments were not used in October due to patients not cancelling them. Please, if you don't need your appointment, let us know so that someone else can use it and help us to use NHS resources effectively. Some of our patients will have noticed that we have a kiosk in reception, recruiting those who are interested in helping the NHS to research dementia. If you are interested in signing up, please use the tablet provided or ask at Reception for help if you need it. This is a national programme of research and more information can be found by clicking this link. Thank you for your support. We have recently been advised that we have a won an award from The University of Manchester for the quality of our teaching provided to undergraduate medical students. We would like to thank all of our patients who agree to be seen by medical students whilst at the practice - you are helping us to help train the doctors of tomorrow. If you haven't had your flu jab yet and you have had a letter advising that you are eligible for one, why not come along to one of our walk in clinics? They are being held on Thursday mornings, 9am - 11am on the following dates: 12, 19, 26 October and 2 November 2017. No need to book, just come in, collect a number from the table in the foyer and take a seat until your number is called. There is a national telephone network problem today that is affecting Firsway intermittently. Please accept our apologies for any problems you may have had in getting through to us - this is beyond our control and is affecting millions of people across the country. Please keep trying as we know this fault is intermittent. Thank you. In the month of September 253 patients missed their appointments here. Please help to avoid wasting appointment times by cancelling unwanted appointments. Have you had your flu jab yet? On Saturday 23rd September 2017, 968 patients had theirs at our first walk in clinic of the season. Thank you to all the patients who gave us some lovely feedback on the day. Our next clinic is being held on Saturday 7 October - if you've received a letter inviting you to have your jab this year, please come along from 8.30am onwards. We will also be closed on Wednesday 4th October from 1pm, if you need any assistance please still call our number on 0161 905 0310 and you will be diverted to Mastercall - the out of hours provider. We will be back open as normal on Thursday 5th October at 8am. In the month of August 200 patients missed their appointments here. Please help to avoid wasting appointment times by cancelling unwanted appointments. We will be closed on Thursday 21st September from 1pm due to protected learning time for all staff. We will be open from 6.30pm - 8pm for pre-booked appointments only and will re-open fully on Friday morning at 8am. If you require any advice please call our telephone number which will provide information on what to do next. We apologise for any inconvenience caused. We are closed on Monday 28th August for bank holiday, We will re-open on Tuesday 29th August at 8am. If you require an medical assistance please call NHS 111 or attend your local walk in centre. If it is urgent please call 999 or attend the nearest A&E department. In the month of July 251 patients missed their appointments here. Please help to avoid wasting appointment times by cancelling unwanted appointments. 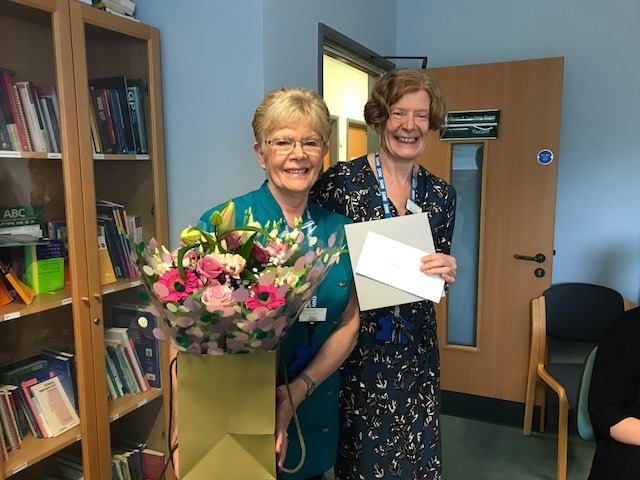 We would like to wish Dr Drabble a very long and happy retirement, she will be greatly missed by us all at Firsway after 29 years. In the month of June, 283 patients did not attend their appointments. Please help to avoid wasting appointment times by cancelling unwanted appointments. Our first walking group met on Wednesday 12 July. The next one is planned for Wednesday 19 July at 11.30am. All are welcome. Please come along earlier if you haven't attended previously in order to register. We are looking for walking champions to now undertake training to lead the walks - for more information please click here. Training takes place on Thursday 20 July 10am - 2.30pm at Firsway. 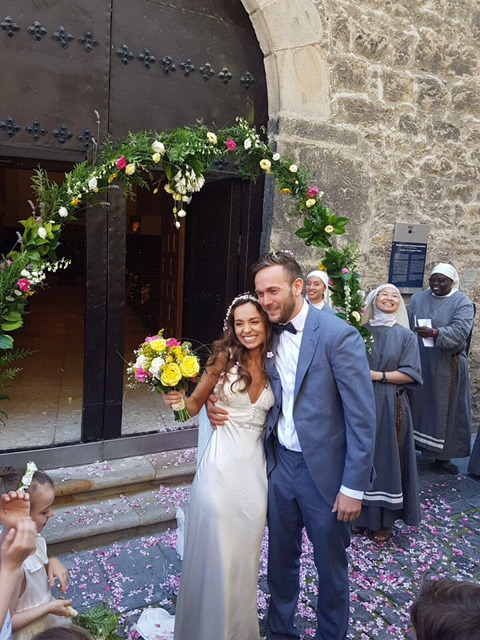 We are delighted to announce that Dr Eleanor Cregan got married last week in Italy. 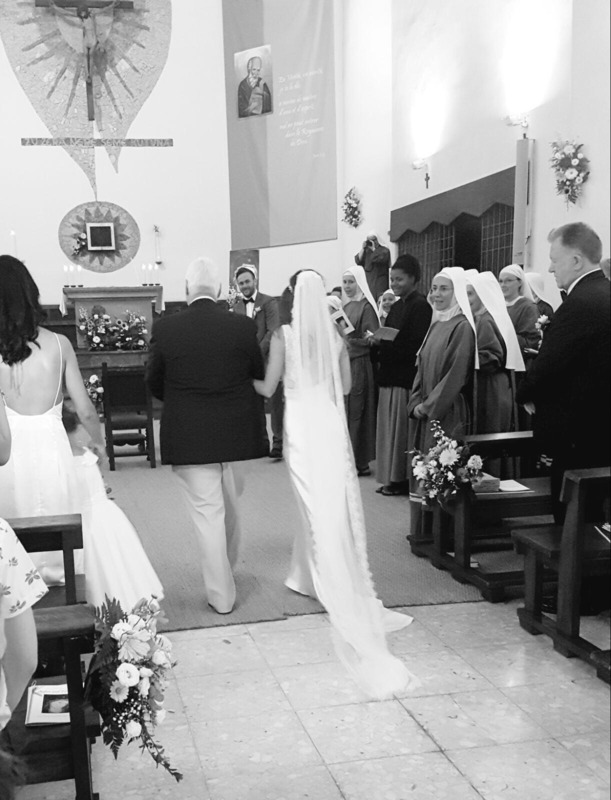 We have been kindly sent photos to share of the happy couple. Congratulations to them both from all at Firsway. 283 patients did not attend their appointment in June 2017. As well as sending text reminders about appointments to patients, we are now sending text messages advising of the non-attendance. Please help us to help other patients by letting us know if you are not able to attend your planned appointment. Thank you. There is a national shortage of Hep A vaccine. We have no stocks left of adult vaccine and very limited supplies of paediatric vaccine. We are trying to order stocks daily but with no success currently. We are sorry for the inconvenience that this will cause. Please still complete your travel vaccination questionnaires and we will let you know what we will be able to provide on a case by case basis. Thank you. Firsway has set up a walking group for patients and staff. The first 30 minute walk takes place on 12 July at 11.30am (please come at 11am to register beforehand). Dr Sutton will be attending the first 3 walks and we are hoping that patient walking champions will identify themselves and take on responsibility for leading the walks going forward. All are very welcome. Please click here for more information. We are very sad to be saying farewell and 'happy retirement' today to Elaine who has worked with us for over 28 years. Elaine has been a very valued and hard-working member of our team and we will miss her greatly. We all wish her a very long and happy retirement. Some may already be aware but after almost 29 years, Dr Karen Drabble will be retiring at the end of July. Dr Drabble has worked at Firsway since its beginning in 2009 and prior to that at Meadway. 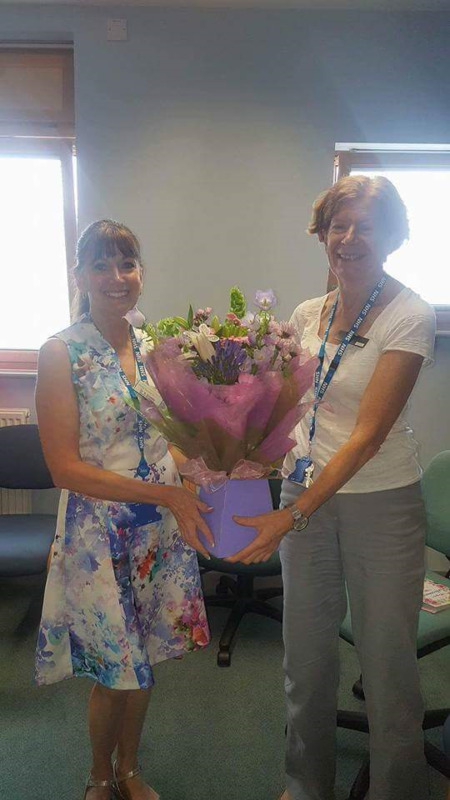 Whilst we and many of our patients will be sad to see Dr Drabble leave, we all wish her a long and happy retirement. Firsway Health Centre will be participating in the National Diabetes Audit 2016-17 to help improve patient care. More information can be found by clicking here or in the patient information leaflet here. We've had a few hot days, with the likelihood of more to come. If you are struggling and would like some tips on how to cope, please click here. Thank you all to those who baked, bought and donated. We are proud to say we raised a total of £178.17. Firsway Health Centre is participating in the Alzheimer's Society's Cupcake Day on Thursday 15 June 2016. Some of our staff will be baking cakes and cupcakes that we will be giving away to patients and staff (hopefully in return for a donation!). Please pop in to support us from 10am until all the cakes have gone and let's raise as much money as we can for the Charity. If you'd like to help us, please contact the surgery and ask for Danielle or Paula. More information about the fundraising event, organised by the Alzheimer's Society, can be found here. Thanks. 266 patients did not attend their appointment in May 2017. As well as sending text reminders about appointments to patients, we are now sending text messages advising of the non-attendance. Please help us to help other patients by letting us know if you are not able to attend your planned appointment. Thank you. Firsway patients who have COPD (Chronic Obstructive Pulmonary Disorder) may soon be invited to take part in a new study that we are undertaking in partnership with Astra Zeneca. This is not a drug trial but is a tool to help gather data about how patients manage their COPD. If you are eligible for the study, you will be contacted by us to ask if you would like to take part. Involvement in the study is on a voluntary basis. More information is available here. We are closed on Monday 29th May and will re open on Tuesday 30th May, if you require any assistance please call NHS 111 for advice or you can attend your local walk in centre. If you need urgent assistance please call 999 or attend your local A&E department. Next week is International Clinical Trials week and on Thursday 18 May 2017 we will have a representative from the NHS's local research network in the practice answering any questions you may have about getting involved in clinical research and trials. If you would like to speak to one of the team, they will be located in the downstairs waiting room between 9am and 3pm. If you would like more information about research in the NHS, please click here. Almost 95% of patients attended their appointments in April 2017 compared with 93% in March. Please help us to help you by cancelling your appointment if you don't need it. Thank you. We will be closed on Thursday 27 April from 1pm due to protected learning time for all staff. We will be open from 6.30pm - 8pm for pre-booked appointments only and will re-open fully on Friday morning at 8am. If you require any advice please call our telephone number which will provide information on what to do next. We apologise for any inconvenience caused. We are closed on Friday 14th April and Monday 17th April due to the Easter bank holidays and will re open on Tuesday 18th April at 8 am as usual, If you require advice please call NHS 111 free of charge, if you require treatment please attend your local walk in clinic or nearest A&E department. We have just been issued with an updated list of phlebotomy (blood) clinics in Trafford. Please click here to see the new list. Our next Dementia Friends Awareness session will be held on Wednesday 26th April 2017, 12 noon - 1pm. All are welcome to attend. During this friendly and interactive session you will increase your understanding of dementia and think about the small things that you can do to make a difference to people affected by dementia in your family or the local community. Please call in to the surgery or phone us to book your place. 5 April 2017 - British Red Cross - First Aid Training for expectant mothers, new parents and grandparents. The next British Red Cross First Aid Training for Expectant and new parents will be held on the 21st April 2017 at 11am at Firsway Health Centre. Places are limited, if you would like to attend please contact Reception to book in. During the month of March 268 appointments were wasted by patients who did not attend. Please remember to let us know if you are not able to attend in order to allow other patients to be seen. Did you know that we now have over 14%of our total number of patients registered for Online Access? You can register for Patient Online Access to enable you to book and/or cancel appointments yourself as well as order repeat medication. For more information please click on the 'Online Services' tab above or ask one of our Reception team for details on how to do this. You can also receive an appointment reminder message and cancel your appointment by text if we have your up to date mobile number. Our receptionists will be asking you to confirm this each time you contact the practice. We are trying our best to use the resources we have as efficiently as possible - please help us to help you. Thank you. The next British Red Cross First Aid Training for Expectant and new parents will be held on Friday 17 March at 11am at Firsway Health Centre. This is proving to be a very popular course and as places are limited, if you would like to attend, please contact Reception after 2pm to book in. The British Red Cross will be running another of their very popular sessions on 10 February at 11am at Firsway Health Centre to teach expectant and new parents (from 28 weeks of pregnancy to babies aged up to 9 months old) the basics in first aid for babies - how to deal with burns, febrile seizures and choking. Places on the course are limited. If you would like to attend, please contact Reception after 2pm to book in. During the month of January 233 appointments were wasted by patients who did not attend. Please remember to let us know if you are not able to attend in order to allow other patients to be seen. Did you know that you can register for Patient Online Access to enable you to book and/or cancel appointments yourself? For more information please click on the 'Online Services' tab above or ask one of our Reception team for details on how to do this. You can also receive an appointment reminder message and cancel your appointment by text if we have your up to date mobile number. Our receptionists will be asking you to confirm this each time you contact the practice. We are trying our best to use the resources we have as efficiently as possible - please help us to help you. Thank you. We have a part time job vacancy at Firsway Health Centre Monday to Friday 30.5 hours per week, we are looking for an individual who can work in a very busy environment with previous experience in customer service roles. If you are interested please email your CV to laurenhinds@nhs.net as soon as possible before Friday 3rd February. If you would like more information please contact myself on 0161 905 0310. We will be closed on Wednesday 25th January from 1pm due to protected learning for all staff and will re-open on Thursday 8am. If you require any advice please call our phone number and you will be transferred to Master call. Please accept our apologies, We are currently experiencing difficulties with incoming calls since 1pm. The phone provider is currently working on the issue and trying to resolve as soon as. In the month of December, there were 253 patients that did not attend their appointment. If you have an appointment you no longer need or if you cannot attend, please call the surgery to allow other patients to use the appointment. We would like to say a huge thank you to our lovely patients. This is just a selection of some of the lovely gifts we have received over the last couple of weeks. We wish you all a happy and healthy festive period and best wishes to you all for 2017. We will be closed on Monday 26th and Tuesday 27th December and will re-open on Wednesday 28th December at 8am. If you require advice please call NHS 111 free of charge, if you require treatment please attend your local walk in clinic or nearest A&E department. Also we are closed on Monday 2nd January and will re-open on Tuesday 3rd January 2017. The British Red Cross will be running 2 separate sessions in January at Firsway Health Centre to teach expectant and new parents (from 28 weeks of pregnancy to babies aged up to 9 months old) the basics in first aid for babies - how to deal with burns, febrile seizures and choking. These sessions will be held on Friday 6 January 2017 and Friday 20 January 2017 at 11am. Places on the courses are limited. If you would like to attend, please contact Reception after 2pm to book in on your preferred date. There is an issue with broadband currently, we have someone looking into this and we are still able to answer your calls on a diverted line. Update, all now resolved, apologies for any inconvenience caused. Please accept our apologies, We are currently experiencing difficulties with incoming and outgoing calls. We are working to resolve the issue as soon as possible. Please accept our apologies for the problems with getting through to us on the telephone this morning. This was caused by a routing issue at the network level and affected many practices in Manchester and London and was outwith our control. We did have a temporary solution in place trying to divert calls to a mobile and managed to return the calls of many patients but we know we won't have been able to capture the details of all callers. We have been advised that the problem has now been fixed. 7th December 2016 - Key 103 Mission Christmas. Firsway Health Centre is supporting Key 103 Mission Christmas again this year. We will be a drop off point for anyone who would like to donate a gift to a child in need. The last day to donate here will be 16th December. 1st December 2016 - Patients who did not attend their appointments. In the month of November, there were 318 patients that did not attend their appointment. If you have an appointment you no longer need or cannot attend, please call the surgery to allow other patients to attend. Our new telephone system has now been live for just over a week. After a small teething problem all is now working fine and yesterday, for example, we took in excess of 600 calls. We hope our patients are seeing the benefit of the system, especially knowing their position in the queue during our busy periods. If you have any comments or feedback about our new system, please let us know. Please also be aware that our new system records the majority of calls both incoming and outgoing. We have just produced a new patient information leaflet about home visits. Please either visit our Home Visits page (via the Appointments tab) or click here to familiarise yourself with our policy. Thank you. We are very pleased to be able to announce that we are having a new telephone system installed on Saturday 19 November 2016 which will go live on Monday 21 November 2016. We hope that all callers to the surgery will find there to be a huge improvement in how calls are managed in the queuing system and will appreciate the increased number of options that can be chosen initially when the calls are answered. We have planned this very carefully so we hope the transition to our new system will be seamless. Please bear with us whilst our staff get to know the new system and be patient with them over the first week or two. We will be monitoring how the system works over the coming weeks to ensure our patients get the best service we can possibly provide. If you have any feedback on the new system, please let us know via our comments cards or directly to any member of staff in the surgery. Our reception team play a vital role in organising our GPs and nursing team and helping them to work as efficiently as possible. The attached article explains more about why receptionists ask so many questions of patients and how this can help us to help our patients in the most safe and effective way. Please click here to read the article. 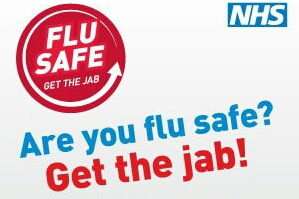 If you are eligible for the flu vaccine please pop along to our catch up walk in clinic with the Practice Nurse on Thursday 20th October, Thursday 27th October and Thursday 3rd November between 9 and 11am only. Our GPs have had their flu vaccinations - have you had yours? Did you know we vaccinated 1,044 patients on the 1st Flu Clinic and 969 on the 2nd Flu Clinic. We recieved lots of positive feedback from our patients. Our 2 main flu clinics take place at Firsway tomorrow (1 October 2016, 8.30am - 11.00am) and next Saturday morning 8 October 2016, 8.30am - 11.00am. All patients eligible for a flu vaccination have been notified. If you think you may be eligible but haven't yet been contacted and have a long term condition, please come along to one of the clinics. We will be publicising details of further walk-in clinics soon. Our next Dementia Friends Awareness session will be held on 25 October 2016, 12 noon - 1pm. All are welcome to attend. During this friendly and interactive session you will increase your understanding of dementia and think about the small things that you can do to make a difference to people affected by dementia in your family or the local community. Please call in to the surgery or phone us to book your place. 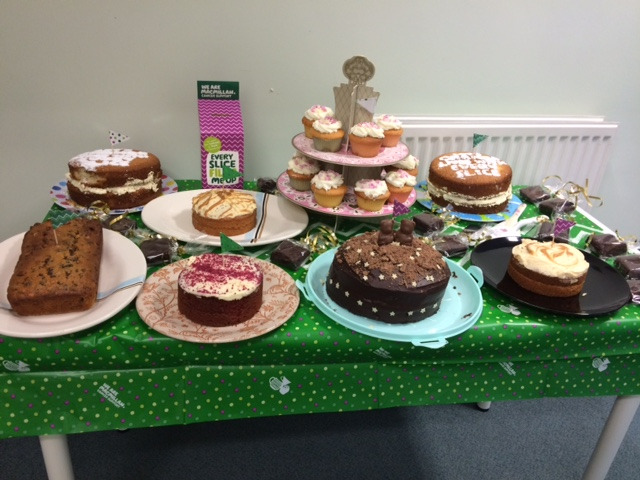 Lots of our staff have either baked or bought cakes today to help raise money for Macmillan. They will be available in the downstairs waiting room if you'd like to try one/make a donation. 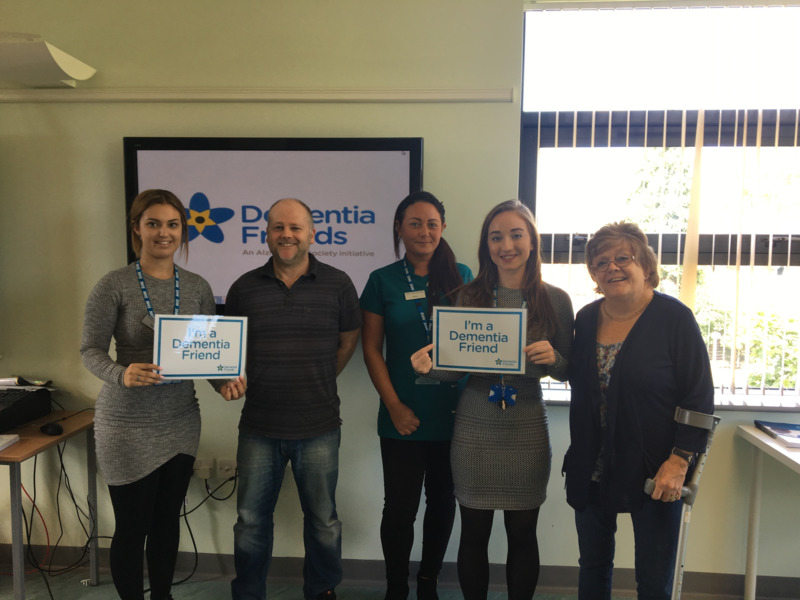 Our two newly qualified Dementia Champions ran their first Dementia Friends event at Firsway yesterday. Very well done Emily and Sinead. Here's a photo of them with a few of the newly trained Dementia Friends. We will be offering more sessions soon - watch this space for dates and how to book. We are currently recruiting a new Salaried GP. For more information, please click here. We would like to wish Maggie a long and happy retirement after 28 years with our practice. We have reviewed the way in which we deal with urgent medication requests and our new policy goes live on 1 September 2016. Please click here for more information. In July we received a 10% response rate to our text messaging feedback survey, ie 447 responses from a total of 4686 appointments. 84% of respondents thought we were doing well. We are working on identifying why the other 16% felt we need to improve. Thank you to those who responded. All feedback is welcome. Would you like to become a Dementia Friend? Firsway Health Centre is offering a Dementia Awareness session on 1 September 2016 at 12 noon. The session will last approximately 45 minutes and is being organised by 2 of our staff who have recently been trained by the Alzheimer's Society as volunteer Dementia Champions. During this friendly and interactive session you will increase your understanding of dementia and think about the small things that you can do to make a difference to people affected by dementia in your family or the local community. Places are limited to 20 so if you would like to come along, please book your place by either telephoning the Surgery after 2pm each day or send an email with your name to: firswayenquiries@nhs.net. Please note that all are welcome, you do not have to be a registered patient at Firsway to be welcome at the session. Please note that we are undergoing a programme of redecoration at the surgery during August and there will be some areas that are out of bounds during this time. We will signpost these areas and apologise in advance for any inconvenience caused. 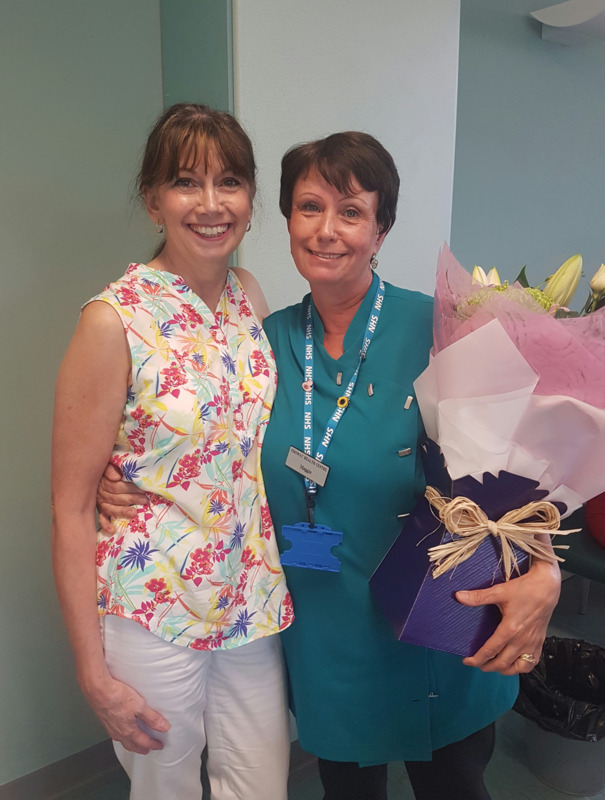 We would like to say a huge Thank You to Dr Tragen who has been at the practice for many years and been a wonderful GP to many patients, we wish her all the best in the future. Yesterday, 18 of our staff attended a training event at Firsway and are now Dementia Friends. Some of our staff are now going to undertake further training to enable them to offer awareness raising sessions for patients and their carers. We'll let you know when we can start offering these sessions but in the meantime, for more information, click here. Please can we ask patients/public members not to park in the car park over the weekend as the white lines are being done. Thank you. 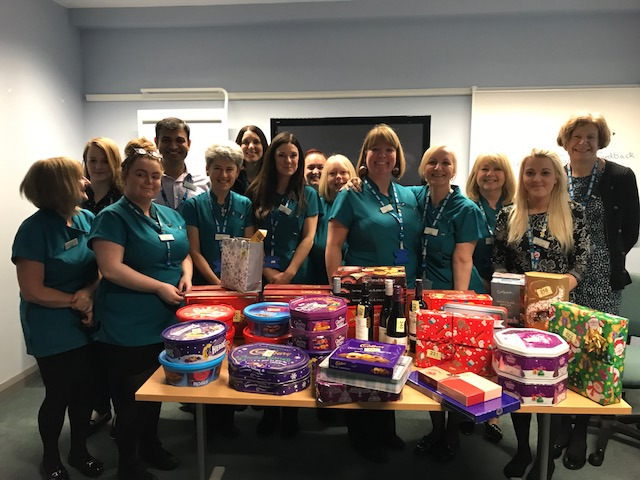 A huge thank you to our staff, patients and members of our Patient Participation Group for supporting our efforts for the Alzheimer's Society's Cupcake Day - we raised £210.21 and donations are still coming in. Here's a few photos of some of our staff and patients. 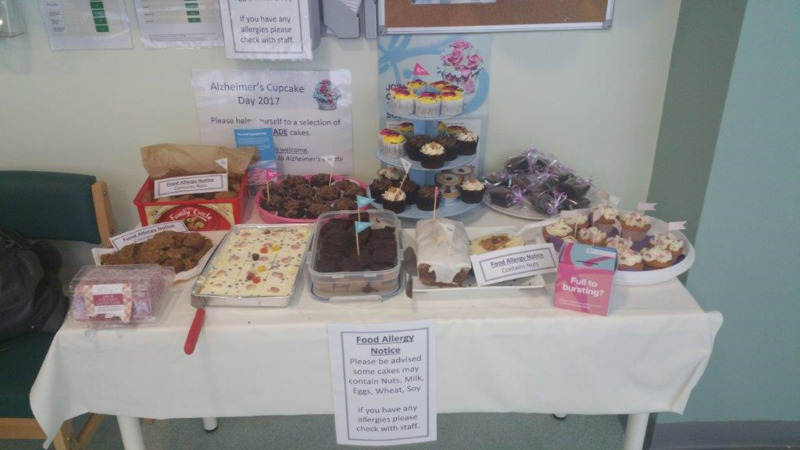 14 June 2016 - Firsway Health Centre is participating in the Alzheimer's Society's Cupcake Day on Thursday 16 June 2016. Some of our staff will be baking cakes and cupcakes that we will be giving away to patients and staff (hopefully in return for a donation!). Some of our Patient Participation Group will be helping us too. Please pop in to support us from 10am until all the cakes have gone and let's raise as much money as we can for the Charity. If you'd like to help us, please contact the surgery and ask for Danielle or Paula. Thanks. 14 June 2016 -Appointments in May - In May 366 patients did not attend their appointment. Please Call the surgery if you are unable to attend to allow someone else to use this appointment. 7 June 2016 - Firsway Health Centre will be participating in the National Diabetes Audit 2015-16 to help improve patient care. More information can be found by clicking here or in the patient information leaflet here. 7 June 2016 - We have recently been re-inspected by the Care Quality Commission as 'Good' with 2 areas of outstanding practice: our work with families at risk and the templates we have developed to build added safety into our prescribing activities. You can read a copy of our report by clicking on the link below. We will be closed on Wednesday 18th May 12-2 pm due to staff training, please still call our phone number 0161 905 0310 and you will be transferred to Master call. We would like to inform all of our patients as of today we will no longer be holding a blood clinic at Firsway Health Centre which is run by Pennine Care. We have been informed by Pennine to direct patients to Chapel Road Clinic on Fridays 9.15am - 11.15am. Please see reception if you would like a list of all the local clinics with their times. We apologise for any inconvienence caused. In April 354 patients did not attend their appointment. Please Call the surgery if you are unable to attend to allow someone else to use this appointment. We would like to say a huge Thank You to our staff member Elaine who has been with us for over 25 years. Just to inform you the junior doctors strike day is tomorrow and wednesday this may have an impact on routine appointments. We apologise for any inconvenience this may cause. We would like to welcome Dr Harper and Dr Chong who will be with our practice for 4 months. We apologise that EPS is currently down at the moment for some users in Trafford, this may cause a delay in your prescription being sent to your chosen pharmacy. If you have any concerns please contact the surgery and speak to the receptionists. We receive, on average, in excess of 600 telephone calls to the surgery each day. Please help us to help you by registering for on-line access to book appointments/request repeat medication. Thank you.